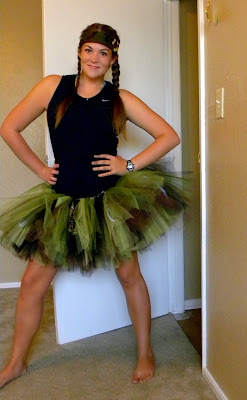 Camo tutu, black tank (and shorts underneath), camo bandana, and tomorrow I'll have on some eye black of course! I couldn't decide what shoes I wanted to wear at first, but Champ's recent run in with my running shoes, made that decision easy. Half-eaten shoes are definitely mud-run approved! Now I am meticulously packing my race day gear and determined not to forget anything this time (it would be a first!). 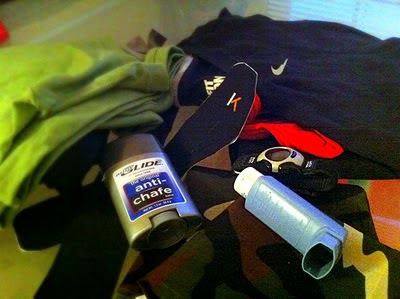 Mud races, like the Warrior Dash, are obviously very different than regular road races so I'm having to pack a little differently. Some things I normally never run without will not be with me because I don't want them to get ruined in the mud, like my garmin and my road id. Other things I don't normally need, are a must, like a change of clothes and a towel. It feels so weird to leave my road id and garmin behind! Don't forget to enter my giveaway! Tonight is the last night to enter!! I love the tutu!! You're going to have so much fun! I love your outfit! I hope you had a great dash fellow Lilac Tribe member. LOOOVE the tutu and so glad it was fun as well. I made it myself. I just followed one of the basic no sew tutorials out there and used a dark green, a light green, and a brown. I doubled up two strips for each knot so it would be really full and i did two knots of each color in a row. It's time consuming but it's not too hard. There are also lots of etsy sellers that have similar ones available if you wanna save some time.